We normally ship orders within 1 to 3 business days. Most of our orders are shipped using USPS. You will be offer different shipping choices during checkout. We will notify you via e-mail, when your order is shipped. In the event of a delay longer than 3 business days, you will be contacted and other arrangements can be made at that time. If we do not contact you within 5 business days, please contact us to check the status of your order. All custom items allow at least 2 weeks for manufacturing. We will notify you via e-mail if it will take longer. We do ship globally, as regulated by the laws and regulations of the United States Government. If you are having trouble finding your country, please contact us. International orders may be subject to VAT, import duties and/or taxes, which are levied once the package reaches it destined country. We ship these orders “duties and taxes unpaid” and do not collect the VAT, duties and/or taxes and cannot predict what the particular charges may be. If these charges are incurred, they must be rendered for the order to clear customs. For more information regarding your country’s custom policies, please contact your local customs office. Richard L. Greenwald LLC guarantees you will be 100% satisfied with your purchase, or your money will be refunded to you in the same manner it was submitted to us. If you are dissatisfied with your purchase, within 30 days of receipt, please e-mail us to get a return authorization and a shipping address. 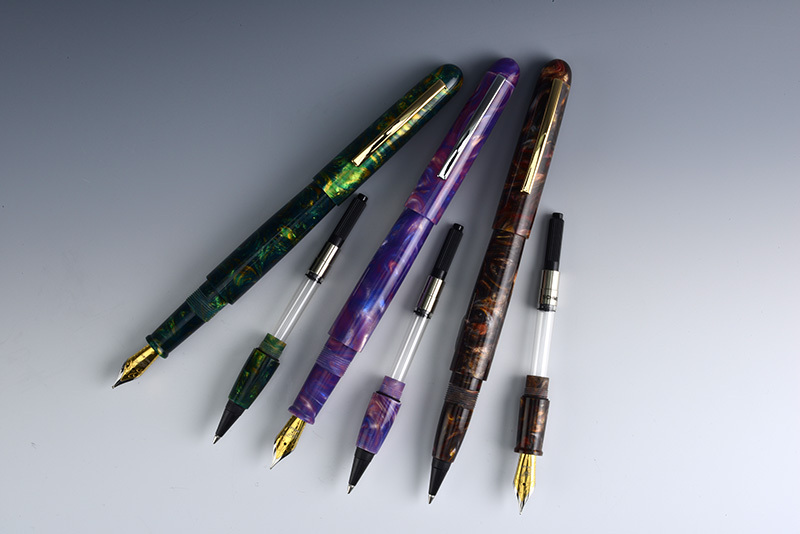 Pens and pen Parts must be in new condition with all of their original packaging intact. Photographic prints must be free from damage, tears, liquid spills and folds. Custom parts that have been modified by others are not returnable. Clearance items are not returnable. If a custom cast item has an unseen interior void, please contact us for a replacement. We are dedicated to providing communicative and caring customer service. If we have made a mistake, we appreciate the opportunity to make it right for you. All products that we manufacture are warranted against manufacturing defects for 1 year from the date of purchase (unless otherwise noted). Consumables, such as ink cartridges, refills or lost springs are not subject to the warranty. Damage from abuse, such as breakage from accidental dropping, chewing, deep scratches, etc are not covered under the warranty. Defect as scars, voids, incursions in natural products like leather, wood, cork, etc are not include under the warranty. Products made by others are not included under our manufacturing warranty. Most do not have a warranty but we will do our best to rectify the problem. Clearance items and Hand Cast Plastic Pen Blanks are not covered under any warranty. This notice sets out how Richard L. Greenwald LLC uses and protects any information that you give Richard L. Greenwald LLC when you use this website. Richard L. Greenwald LLC is committed to ensuring that your privacy is protected. Should we ask you to provide certain information by which you can be identified when using this website, then you can be assured that it will only be used in accordance with this privacy statement. Richard L. Greenwald LLC may change this notice from time to time by updating this page. You should check this page from time to time to ensure that you are happy with any changes. This notice is effective from August 2009. We employ 128-bit secure encryption technology when transmitting your sensitive information to our server. If you do not see the “secure lock” icon at the top of your browser, restrain from entering sensitive information. If you have any questions or concerns regarding your privacy or security, please contact us. if you have previously agreed to us using your personal information for direct communication purposes, such as newsletters, you may change your mind at any time by writing to or emailing us at info@richardlgreenwald.com. You may request details of personal information which we hold about you under the Data Protection Act 1998. A small fee will be payable. If you would like a copy of the information held on you please email us at info@richardlgreenwald.com. If you believe that any information we are holding on you is incorrect or incomplete, please write to or email us as soon as possible, at the above address. We will promptly correct any information found to be incorrect. By using this website, you agreed to all the terms mentioned in this privacy notice. The term “Richard L. Greenwald LLC’ or ‘us’ or ‘we’ refers to the owner of the website whose registered office is in Potomac, Maryland. The term ‘you’ refers to the user or viewer of our website. This website contains material which is owned by or licensed to us. This material includes, but is not limited to, the design, layout, look, appearance and photographs and graphics. Reproduction is prohibited other than in accordance with the copyright notice, which forms part of these terms and conditions. You may not create a link to this website from another website or document without Richard L. Greenwald LLC’s prior written consent.